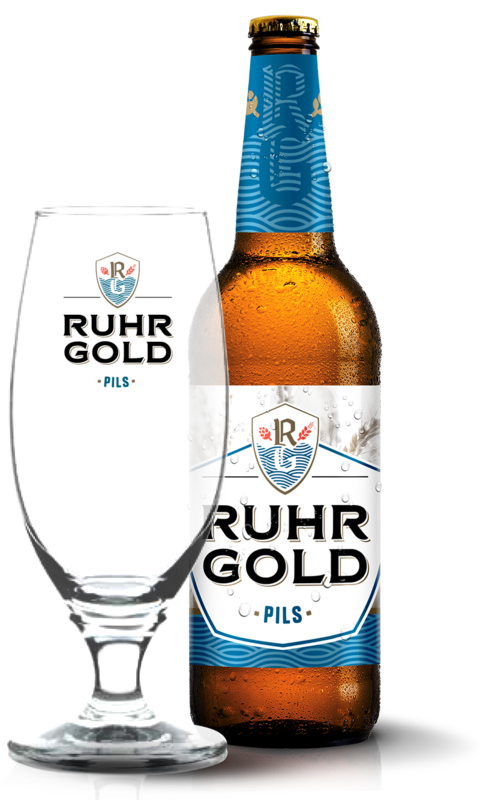 RuhrGold Pils is a powerful and tasty lager, brewed according to the German Reinheitsgebot, the oldest commodity law in the world. Enjoy the characteristic taste of RuhrGold, a perfectly balanced and lager with 100% natural ingredients. RuhrGold Brewery makes a tasteful Premium Pilsener that has been available in the Netherlands since 2015. A distinctive lager, with extra hops where the traditional ingredients remain on the taste palette. The name RuhrGold is derived from the river De Ruhr in the German Ruhr area. RuhrGold is authentic quality lager with a characterful hop flavor, which gives the lager a spicy character. Pils (also called pilsener or pilsner) is a type of beer first introduced by the German Josef Groll in the town of Pilsen (Czech: Plzeň) in the former Austria-Hungary and the current Czech Republic. was brewed. The name is derived from the name of the city. Pils contains approximately 5% alcohol. It is a bottom-fermenting beer with a golden yellow color. Pils comes into its own at a temperature of 4 degrees Celsius. As standard, lager is brewed from malt, water, hops and yeast, and sometimes sugar and unmalted grains (corn, barley and others) are added. These last ingredients do increase the alcohol content, but add little to the taste. Sometimes caramel is also added to make the color darker. According to the German Reinheitsgebot, this addition of additives is, however, highly unusual. After the beer has been aged, it is usually filtered, resulting in a clear liquid, but a large part of the taste is lost. That is why lager has the reputation of having a fairly weak taste. Certainly the big brands use a commercial recipe that should appeal to the largest possible audience and is therefore not characteristic. Smaller pill brewers, such as RuhrGold, more often come with outspoken hoppy, unfiltered pilseners, who are so appreciated by true enthusiasts. Do you want to serve a really tasty beer at your festival, in your clubhouse or in your catering establishment? With the right attention to service, support and quality? Of course RuhrGold!